Just when you thought everyone on the planet had seen Frozen, you hear something crazy like this. Actress Kristen Bell has revealed that she and husband Dax Shepard have yet to allow their children to watch the insanely popular Disney film, meaning they haven't experienced the euphoria brought to millions of kids around the world (thanks to Bell and Idina Menzel)... but there's a totally valid reason. The APA recommends that you let kids watch TV when they're 2 and a half, so we’re trying to follow that, which unfortunately is not realistic for all parents — I understand, we’re shooting for the moon. [It's also for] their imagination, just so they don’t become sedentary and used to zoning out to videos. But she's certainly seen videos, she loves the hell out of Snoopy! But we're trying. She certainly hasn’t seen anything Frozen. Kristen Bell's kids may not currently be in on the Frozen craze, but the Forgetting Sarah Marshall actress admits it won't be this way forever. 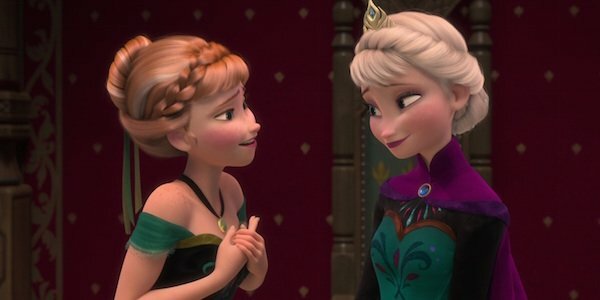 She eventually plans on exposing her children (the aforementioned Lincoln and her younger sister Delta) to Elsa, Anna, Olaf and Kristoff at some point in the future, adding she's excited for them to take in the "sister themes." While it is crazy to think there is a single kid on earth who hasn't yet seen Frozen, it is also somewhat refreshing when put into a context like this. I'm no parenting expert, but my guess is that it probably can't hurt to withhold (at least for a little while) from unleashing onto our children the media-saturated world in which we currently live. Frozen has become Disney's top grossing film of all time, thus resulting in a five-year plan to extend the brand. The short Frozen Fever hits March 13, and there have also been discussions of a full length feature sequel to the icy animation but no official release date has yet been set.